Malayalam actor Sunny Wayne married Renjini Kunju yesterday (April 10) at Guruyavur Temple in Kerala. It was a low-key wedding ceremony attended by family members and close friends of the couple. Post the wedding ceremony, we even saw pictures of the couple doing rounds of social media. There were even pictures of superstar Dileep posing with the newlyweds. There were various other pictures and videos that hit the internet and went viral instantly. A new picture of the couple has surfaced online, it is the one from their haldi ceremony. Sunny and Renjini looked stunning in shades of yellow. 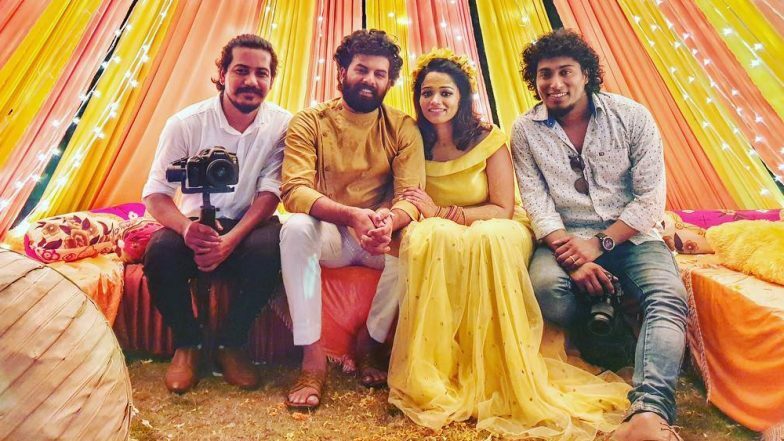 Sunny Wayne-Renjini Kunju Wedding: Actor Dileep Poses With the Newlywed’s, Nivin Pauly Extends Heartfelt Wishes. This picture of Sunny Wayne and Renjini Kunju has been shared on Ambu Ramesh’s Instagram handle. We had also seen the couple’s picture from their wedding ceremony shared by Richard Antony. The couple’s haldi ceremony picture proves that it was a fun-filled affair. Sunny is seen dressed in a traditional outfit whereas Renjini was dressed in a bright yellow gown and also sported a yellow floral tiara. Second Show Fame Sunny Wayne Ties the Knot With Renjini Kunju at Guruvayoor! Announces the Big News on Facebook. Sunny Wayne announced the news of his wedding by posting his wedding picture on Facebook. Since then fans of the actor and many celebs have wished the couple through social media platform. Dulquer Salmaan, who played the lead in Second Show, posted the message on Facebook, “Congrats my dearest sunnychan and kunju !!! Such a big day and finally. We've been waiting for so long !! This picture gives us so much joy ! Love and more love to the two of you forever more !” Talking about the newlywed’s wedding reception, it is expected to take place today evening at the Edassery Resorts in Kochi. We wish Sunny and Renjini a happy married life!